Mt. Warusawa-dake (悪沢岳), elev. 3141m, and Mt. Akaishi-dake (赤石岳), elev. 3120m, are two peaks on my list of the 25 highest mountains in Japan which are close enough to be climbed on the same trip, or what I referred to as "couplet mountains" on my Mt. Suisho-dake/Mt. Washiba-dake page. I had the pleasure of climbing these two peaks in the Southern Japan Alps (南アルプス), which are Japan’s 6th & 7th highest mountains, over a 3-day weekend in August 1995. Both Mt. Warusawa-dake (悪沢岳) and Mt. 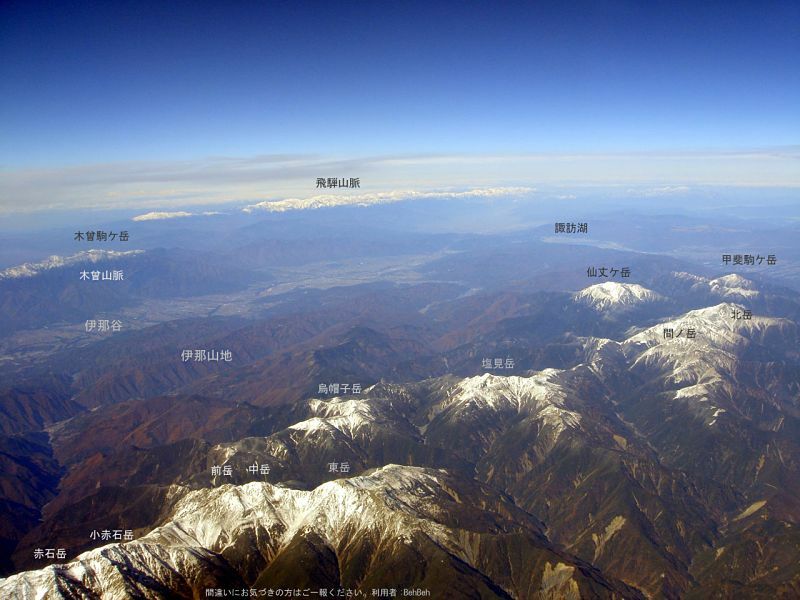 Akaishi-dake (赤石岳) are one of the 100 Famous Japanese Mountains (日本百名山, Nihon Hyaku-meizan). 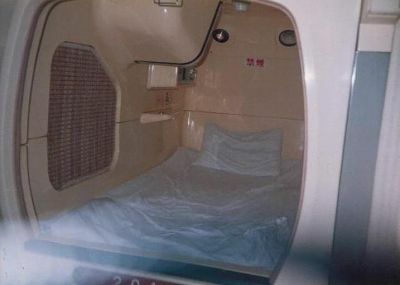 One of my most memorable experiences on this mountain climbing trip was to sleep Friday night, August 11, 1995 in a coffin-sized room at a capsule hotel, my first and only such experience in over 20 years of living in Japan. I must admit it was a very interesting & pleasant overnight stay. They had a HUGE public bath and the staff were very cordial and patient with my very poor Japanese skills (see pic of my coffin below). My cozy coffin even came equipped with a TV, reading lamp, radio, nightstand, and an alarm clock. The best thing is that it was close enough to JR Shizuoka Station (静岡駅) that it was very convenient for me to catch my early morning bus from there on Saturday morning into the Southern Japan Alps (南アルプス). On Saturday, August 12, 1995 I caught the first bus from JR Shizuoka Station (静岡駅) headed for Hatanagi Daiichi Dam (畑薙第一ダム) around 6 AM, as I recall. This bus ride takes around 3.5 hours. From the dam you catch a smaller minibus that will take you to the Sawara-jima (椹島) trailhead in about an hour's time. By the time I finished these two bus rides and completed my backcountry registration form, it was already late morning before I hit the trail from my starting point, Sawara-jima (椹島). With Sawara-jima (椹島) as both the starting and ending points, you can tackle Mt. Warusawa-dake (悪沢岳) and Mt. Akaishi-dake (赤石岳) in a loop route. I chose to climb Mt. Akaishi-Dake (赤石岳) first, hiking the loop in a clockwise direction (please see Yamareco route map below, which follows the same course I took exactly). My 17-year-old Yama-to-kogen (山と高原地図) 1:40,000 hiking map for this area shows the hiking time from Sawara-jima (椹島) up to Akaishi-goya (赤石小屋) to be 5 hrs., which I guess is still fairly accurate for one in reasonably good shape. In fact, it’s an over 2000m elevation gain from Sawara-jima (椹島) to the summits of both Mt. Warusawa-dake (悪沢岳) & Mt. Akaishi-dake (赤石岳). 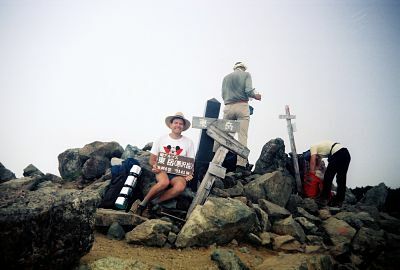 This is noteworthy in that to my best recollection, this 2000m figure is the largest trailhead–to–summit elevation gain that I've ever encountered during the past two decades in scaling any of the 25 highest mountains in Japan. I may of course wind up having to eat my words later, but I'm going to let this rather bold statement stand for the time being. 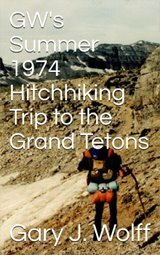 The next day (Sunday, August 13, 1995) was also a fairly rigorous day of hiking when I managed to scale Mt. Akaishi-dake (赤石岳, elev. 3120m, Japan's 7th highest peak) and the three peaks of Mt. Arakawa-dake (荒川岳), also known as the Arakawasanzan (荒川三 山). The Arakawasanzan (荒川三 山) include Mt. Mae-dake (前岳); Mt. Naka-dake (中岳, elev. 3083m, Japan's 13th highest peak and also known as Mt. Arakawa-naka-dake, 荒川中岳); and one of my main targets for this trip, Mt. Warusawa-dake (悪沢岳), also known as Higashi-dake (東岳), elev. 3141m, the 6th highest mountain in Japan. I also climbed Mt. Senmai-dake (千枚岳) that day before stopping at the Senmai-goya mountain hut (千枚小屋) where I spent the night. Well…… MOST of the night. This trip was during the Obon holidays, when most Japanese are given time off from work (usually 3 days in mid-August) to return to their hometowns to honor the departed spirits of their ancestors. Thus, it is a very popular season in Japan for outdoor activities, including mountain climbing. 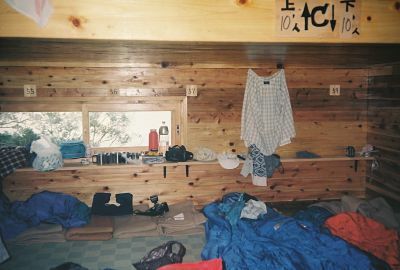 As a result, it was SO crowded at the Senmai-goya mountain hut (千枚小屋), that they were sleeping TWO people per usual sleeping space, in an alternating head–foot/foot–head arrangement. Just my luck that my sleeping "partner" was an older man who liked to toss and turn in his sleep. Consequently, by 3:30 AM I had had more than enough of being kicked in the head by his feet, so I got up quietly and in the darkness of the hut, packed up my stuff and headed out. Since it was still nighttime when I started hiking, I had to use a flashlight to see the trail as I descended through a very thick forest. This turned out to be a bit of an unnerving experience, in view of not only the pitch-black darkness of the forest, but the uncomfortable silence (there was no wind or rustling leaves), broken only by the occasional unfamiliar animal-like sounds coming from behind me. Let me be clear…..I don’t believe in ghosts, but I'll just come right out and say it was downright "spooky." In retrospect, I guess that really wasn’t such a smart thing to do, especially being by myself, but on the bright side, I was able to get back down to the Sawara-jima (椹島) trailhead in time to catch the first morning bus out @ 6:30 am. Another interesting turn in my exciting journey was that when I got back to Hatanagi Daiichi Dam (畑薙第一ダム), as I recall, there was going to be at least a 2-hr. wait for the next bus to JR Shizuoka Station (静岡駅), so I hitched a ride with a nice Japanese guy who drove me and a couple of other hikers back to the station. Very friendly fellas; in fact, we all enjoyed a nice soba lunch together near the station before parting ways. The thumbnail images below are a sampling of my pics hosted by Flickr. Clicking the collage opens up my Mt. Warusawa-dake (悪沢岳) and Mt. Akaishi-dake (赤石岳) photo page at Flickr. I hope they give you a sense of the exciting, "back-to-nature" experience of what it was like to actually be there. Enjoy ! Mt. 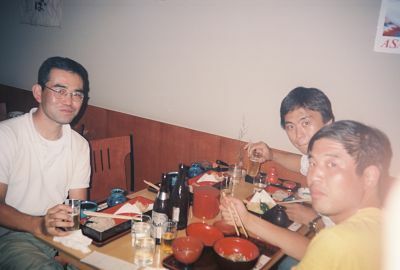 Akaishi-dake (赤石岳) pics, taken Aug. 12-14, 1995. In 2011, from 7/16 to 8/31, there were 2 buses per day departing JR Shizuoka Station @ 9:50 & 13:15, and 3 buses per day departing Hatanagi Daiichi Dam @ 14:25, 15:30, & 17:50. In summary, climbing Mt. Warusawa-dake (悪沢岳) and Mt. 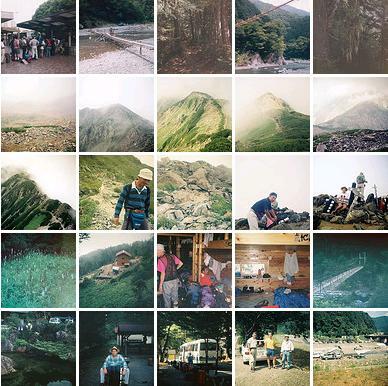 Akaishi-dake (赤石岳) was a rigorous, yet truly rewarding hiking trip. To my knowledge, the over 2000m net elevation gain from trailhead to summit on this trip is the largest I've ever encountered while scaling any of the 25 highest mountains in Japan. To be exact, it's a 2041m vertical gain (6696 ft., or 1.27 vertical miles) from Sawara-jima (椹島) to the summit of Mt. Warusawa-dake (悪沢岳). Ouch ! Please stop by again soon, as I hope in the future to update this page on climbing Mt. Warusawa-dake (悪沢岳) and Mt. Akaishi-dake (赤石岳) with more details as they become available. In the meantime, I hope you have a few extra minutes to check out my pages on the other highest mountains in Japan, as well as the rest of my website. Thanks so much for visiting, and if you have any questions for me, by all means please give me a shout by clicking on the "Contact Me" link. I would also love to hear your personal story if you've already climbed some of these peaks. But if they're still on your list, I wish you my most heartfelt good luck. GO FOR IT ! !